The Marquis Arms (P.H = Public House) near Fforestfach Cross and a only short walk from Calfaria Chapel. The corner building sold antiques and original Marquis, is roughly where the current Marquis car park is today 2012. Reproduced from the (1868-1892) OS map, without my references to the Marquis Arms. First seen on the 1868-1892 Ordnance Survey map. Panorama - Marquis Arms, Fforestfach, Swansea Dec. 2012. The house with the Marquis Arms sign is in the earlier photo above, less 2 front chimneys. (WGA) Reported to have been named after the Marquis of Worcester this was the title given to the heir to the Duke of Beaufort. 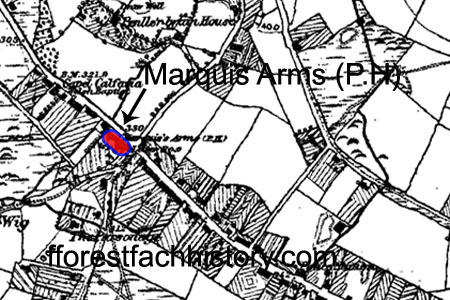 The Duke was a major land owner in and around Fforestfach and it was probably his land the Marquis Arms was built on . (C) 1843 The Marquis Arms was leased in 1843. (Mentioned in Cambrian 1879 18 July). (C) Q14 CRIME AND PUNISHMENT etc. 1848 May 12 Cwrw Bach by William Davies, at Tywyth,near 'Marquis Arms', Swansea - Murder by Irish Navvies. (C) Q14 CRIME AND PUNISHMENT etc. 1848 May 12 Swansea murder inquest at the Marquis Arms - Edward Morgan, Griffith Joseph, David Williams, Cwmbach (witnesses). (C) Q14 CRIME AND PUNISHMENT etc. 1848 May 12 Two murders commited near Tywyth, and the Marquis Arms, on Swansea, Carmarthen Road. (C) Q14 CRIME AND PUNISHMENT etc. 1848 May 19 Swansea murder inquest:Mrs.Ruth Evans,Landlady of The Marquis Arms,gives evidence. (C) F51 DISASTERS AND ACCIDENTS,etc. 1848 Sep.08 Inquest on Griffith Davies, aged 6 - before C.Collins, at Marquis Arms, Swansea. (C) F56 DISASTERS AND ACCIDENTS,etc. 1849 Jan.26 Marquis Arms, Swansea inquest: John Morris aged 20 killed at Gorse Colliery. (C) F56 DISASTERS AND ACCIDENTS etc. 1856 Sept.19 Inquest Marquis Arms, Raven Hill - witness William Evans. (C) Q18 CRIME AND PUNISHMENT etc. 1857 Jan. 09 Swansea Police:WM.Lewis assaulting police officer James Mathews in the Marquis arms. (C) Q31 CRIME AND PUNISHMENT etc. 1857 Jan. 09 Swansea Police:James Mathews, police officer, assaulted in Marquis Arms,Llangafelach. (C) K51 SOCIAL, PHILANTHROPIC etc. 1861 Oct. 25 Oddfellows-Loyal Raven Hill lodge, Penllegare: Dinner at Marquis Arms, by Mr. Evans, Landlord. (C) H34 BUILDINGS, COMMERCIAL etc. 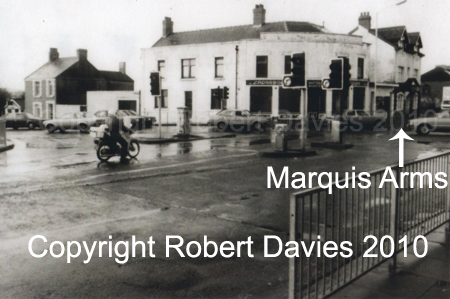 1867 Sept.06 Swansea Police: Licence granted to David Evans the Marquis Arms, Forest fach. SWANSEA DISTRICT VOTER 1869 The Hamlet of Swansea Higher, David Evans of Marquess Arms, freehold lease of house and land. known as part of Raven hill. (C) F56 DISASTERS AND ACCIDENTS etc. 1873 Sept.5 Forestfach Colliery Explosion: Inquest at Marquis Arms. Lewis Williams,collier, witness. (C) 1873 David Evans the landlord died and Mary Llewellyn took over the licence. (C) DISASTERS AND ACCIDENTS etc. 1877 Mar.16 Inquest: The fatal colliery explosion at Weigh Fach/Worcester, with listed men. (C) DISASTERS AND ACCIDENTS etc 1877 Mar.23 Resumed adjourned inquiry: Mr E. Strick, coroner, into the cause of the colliery deaths. (C) H34 BUILDINGS, COMMERCIAL etc. 1879 July 11 Auction:The Marquis,Ravenhill,double licensed public house,occupied by Mrs Llewellyn. (C) H34 BUILDINGS, COMMERCIAL etc. 1879 Aug.01 Auction of the Marquis Arms, Raven Hill, Swansea, in occupation of Mrs Llewellyn. (SD) P323 SLATER'S DIRECTORY 1880 - SWANSEA 1880 Marquis Arms, Mary Llewellyn, Cockett. (C) H22 BUILDINGS, RESIDENTIAL, etc. 1888 Feb.03 Auction at Marquis Arms Cockett of House occupied by W.Mainwaring by F.G.Gough. P532 KELLY'S DIRECTORY 1891 Fforest fach. Commercial. David Davies, Marquis Arms P.H. (SWDP) C10 DEATHS, DEATH NOTICES 1899 Sept.29 At the Marquis Arms, Fforestfach, Mrs Hopkin. (LIC) 1903 Swansea Old Brewery was the owner . (LIC) 1920 William Hancock was the owners. (LIC) 1946 July Daniel Jarvis was the landlord . (LIC) 1954 Aug. Louis Beatrice Jarvis was the landlord . (LIC) 1957 Nov. Joseph Alexander Williams was the landlord and was still in 1962 . (Hudson) " His father's bakery stood in line with the "Marquis Arms" and near to a once flourishing cloth manufactory". N.L. Thomas, Swansea District and Villages - Fforestfach p.96, printed 1969. - (P) POLLING, VOTERS in respect of Property, including Tenant Occupiers at a Rent of £50 and upwards.